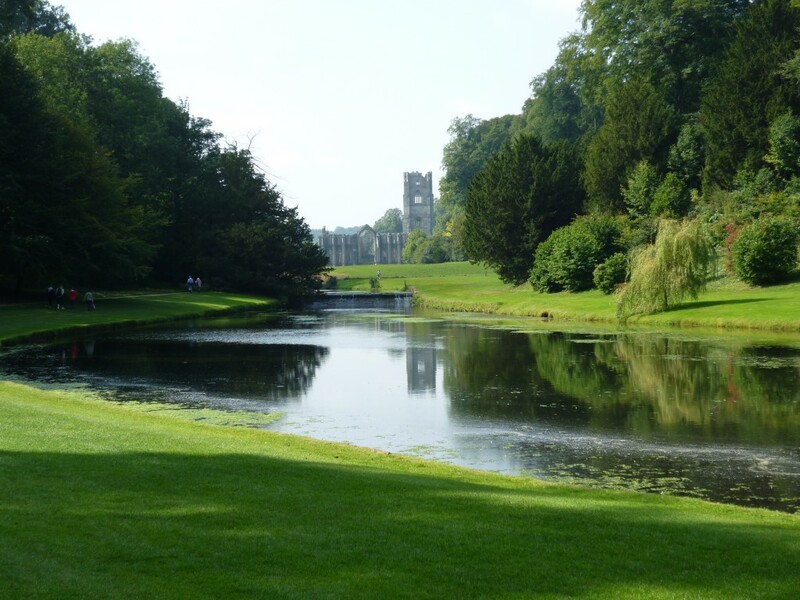 The SCENE is a footpath running alongside the Georgian water gardens, created by John Aislabie, within the National Trust’s Fountains Abbey and Studley Royal estate. DRAMATIS PERSONAE (all in varying states of middle age): STEVE (English, organises things in an overly conscientious manner); DEE (Scottish, full of humour, forthright in her opinions); WALLACE (American, appears wryly entertained by her companions); ALISON (English, always smiling, amazing laugh, glories in everything). DEE: No, we’re not going to say anything. DEE: No, we’re going home now. WALLACE: Well it’s – yeah, yeah. DEE: And that isn’t about judgement value? … which is quite important to me I think, at this point. WALLACE: It’s not a sort of stupid, ‘I like it’. WALLACE: Yeah, I have to contribute to this landscape in terms of my thoughts about it. STEVE (into dictaphone): We’re talking about the moon ponds. WALLACE: This is – yes, and that’s what I do. And there can be very, very divergent, disagreeing forms of appreciation of the same landscape. DEE: Within the same person? WALLACE: Within the same person, but it’s – if any of that makes sense? DEE: It does make a lot of sense. DEE: Oh God, please don’t go there. DEE: No, no, go there. STEVE: I’m going there. Yeah, obviously there’s green politics and all that. STEVE: Some basic phenomenological level where green is soothing. DEE: That’s why they use it in signs. STEVE: As opposed to red, which is…. ALISON: – three million pounds of research about all of that stuff, yes. DEE: But you would ask yourself whether – this is a silly thing now – but you could say to yourself, ‘Is my appreciation of the colour green because of this hard-wiring into the wild…. you know, our relationship with, going back prehistoric, or…’ – but which comes first? Chicken and egg in a way, isn’t it? DEE: No, on you go. DEE: Oh, “swamps and thorns”. STEVE: You mean before they landscaped it? WALLACE: Yeah. What would this look like if it wasn’t flat grass, but low scrub …? WALLACE: Even with quite short things, you’d lose the line. DEE: Yeah, that would upset me. WALLACE: The clear lines. But it would have a different texture to it. DEE: Well it wouldn’t be that space there. ALISON: – a native sort of culture thing. DEE: I think my response would be more just about the clean lines a bit, which is a more – I think Steve’s right, when I say Charles Jencks, it’s the modernist, it’s the . . . you know. STEVE: Well okay, fair enough. STEVE: (to WALLACE) You described the whole place as Teflon. WALLACE: Yeah, sorry, I did. STEVE: Yeah, and there’s a danger that in terms of like – that in looking at a place like this – that we miss the basic thing of the pleasure that people get out of coming here. DEE: Exactly, Steve, this is the point. Of reclaiming pleasure…. DEE: The aesthetics of pleasure – and where can the politics within that be attached? ALISON: I really support you with that notion, I think it’s terribly important. DEE: ‘I really enjoy this space!’ Which is not to say that you can’t have politics attached to that then. STEVE: Right, right. And what’s that pleasure about? And again, if you could start to unpick the layers of that a bit… We have complex responses, I suppose, to a place like this. DEE: I laughed about that. WALLACE: – responses to this was – it was un-thought, it was uncritical. It was, ‘Oh God, I hate these lines’. STEVE: Do we want to head down this way or carry on round this way? DEE: It might be a bit slippy, what do you think? Which is our path down? WALLACE: So I’m having this trouble because of what you said. STEVE: Oh it’s fine, yeah, you can walk down there. ALISON: I’d like to hear more about that. STEVE: You’d like to hear more about what, Alison? ALISON: Why Wallace responded like that yesterday, to being here? WALLACE: Well I think it’s – I wouldn’t attribute too much to it. It’s that first response, and I know from experience that I don’t actually ‘appreciate’ very well. ALISON: But is that something to do with where you have come from, I mean literally? STEVE: Whereabouts are you from Wallace? WALLACE: Yeah, we were force-fed wilderness. ALISON: How many websites do I know that – it all ends up in Boulder? ALISON: I’ve never been to America. WALLACE: – as I do in environmental science. DEE: – control of it and all those things? ALISON: I think we need to meet in the middle. DEE: Yeah, would be beautiful as well. DEE: No, but you get there quickly. DEE: It is, it’s the rolling hills. STEVE: And in some ways, this is simply an extension of Yorkshire, do you know what I mean? STEVE: Of what we drove through this morning. ALISON: No Steve, I don’t know what you mean. Sorry. Too many leaps there! DEE: No, I get you – yeah. STEVE: Yeah yeah, yeah yeah. DEE: The cultural gendering of them, in a way? STEVE: Oh yeah, yeah, yeah, absolutely – but also that this is a response to the actual, natural – quote unquote – landscape, insofar that there is such a thing. 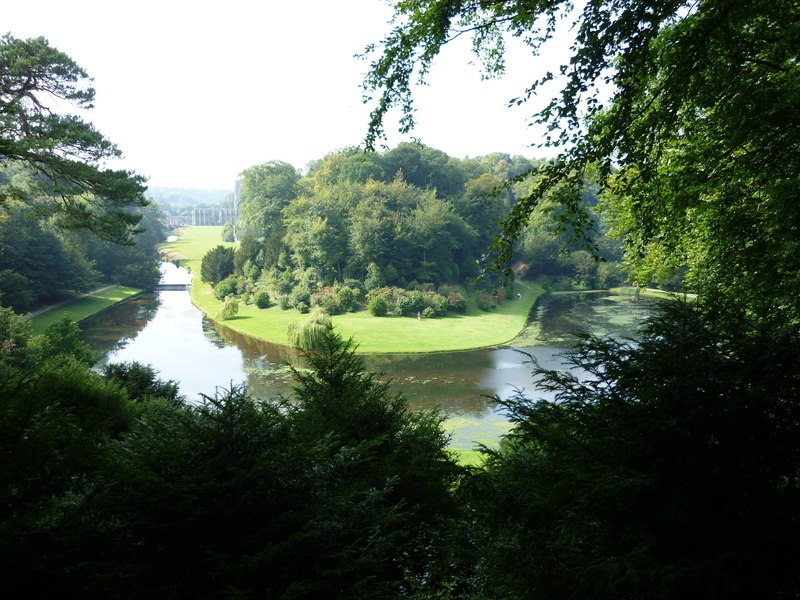 The topography of Yorkshire is very different from the topography of Loch Lomond, you know…? STEVE: Yeah, exactly, yeah, yeah. ALISON: Oh, try coming to the south. STEVE: – yeah, why are they coming to Yorkshire to dump their estates here, as opposed to anywhere else? DEE: The mines are here! DEE: It was cheap here! Wasn’t it the industry – it was the industry of Yorkshire, wasn’t it? STEVE: Well yeah, but that’s a different thing. If you look at Lancashire, which is dominated by mills and the industrial revolution (okay, that’s later than this, but – ), Lancashire isn’t full of stately homes in the same way that Yorkshire is. WALLACE: The land forms there, are not unlike that. DEE: No, that’s right, yeah. You can really see this now, in a way I couldn’t see it from the bridge. ALISON: This is the garden. DEE: Of the wider landscape. And how these very constructed elements talk to each other. And that’s why I like it! DEE: So this leads the eye to that. ALISON: The deer, I think deer have been in there for centuries and centuries. WALLACE: Right, so there probably would have been deer. STEVE: These gardens belonged to Studley Royal House. STEVE: Which was – way on the other side of that parkland. DEE: Oh, I hadn’t reckoned on that. DEE: Yeah, so who came here? STEVE: But also it creates another kind of arcadia, if you like. DEE: Oh, they’d be brought here from the house to here? ALISON: Probably in a terribly stage managed way. ALISON: The 18th century carriage drive and all of that. DEE: Yeah, so it is utterly theatrical. WALLACE: Oh, I love it now! 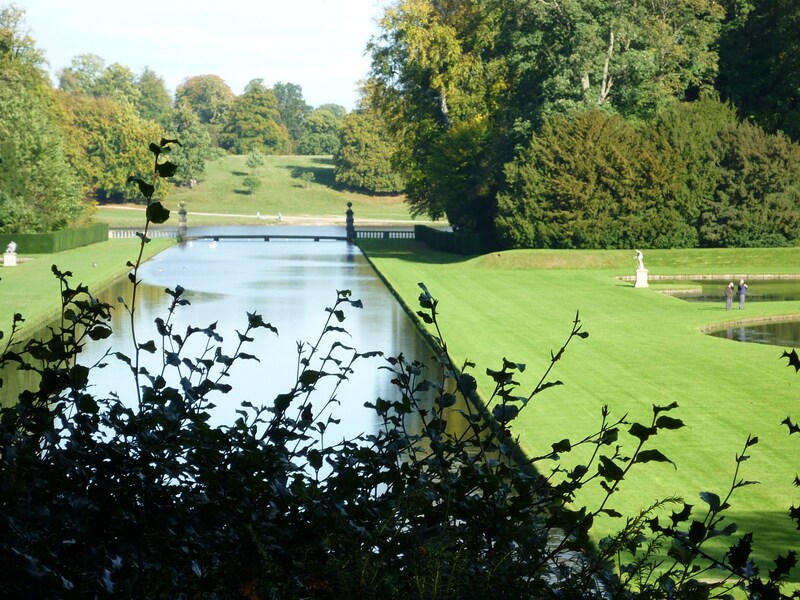 DEE: (pointing across the water garden towards the Grecian edifice opposite) Would there have been tea there? Would you have done anything there? STEVE: It’s the Temple of Piety. 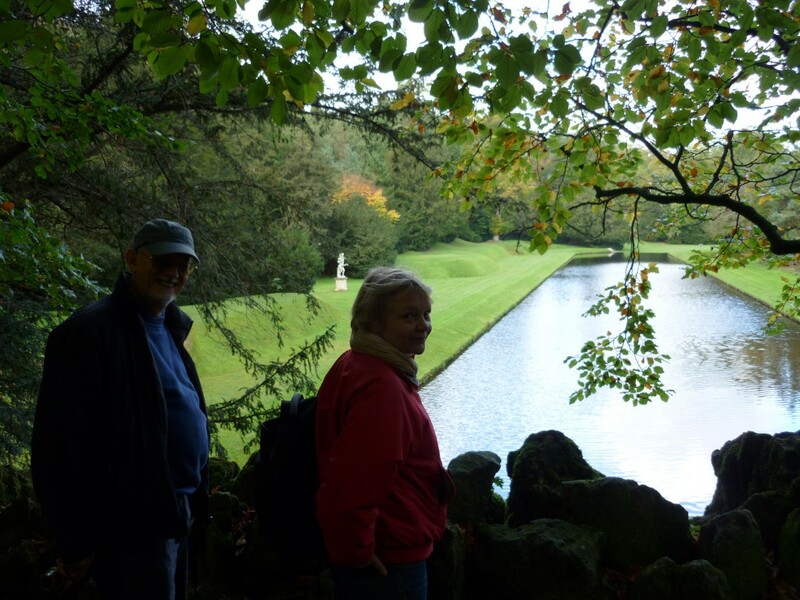 DEE: – private conversation away from your walking companions? ALISON: Possibly it got used for that sort of thing. I’m not sure it’s intended. DEE: Has it? I haven’t been over there. STEVE: – the Temple of Piety. WALLACE: It’s called Temple of Piety. STEVE: Oh, I don’t know, I haven’t checked that. DEE: Which is very interesting. DEE: Yeah, the Fame one is totally superficial and doesn’t last. It’s got hollow columns. STEVE: Oh, oh, oh, oh, oh, oh, right. ALISON: I think the 18th century did a huge amount of that. ALISON: They flung things up in a cheapskate way – because they were just so desperately keen to do it. STEVE: Piety has a solidity to it. DEE: Piety has a solidity at last, it’s not superficial. ALISON: Don’t read too much into this. DEE: No, I think you can never read too much into things, that’s the critical enthusiasm! DEE: Oh, I see, right, yeah, yeah. STEVE: It has echoes of – it is, yeah, it’s a stage. WALLACE: I’d put the audience on a barge here, that moves. 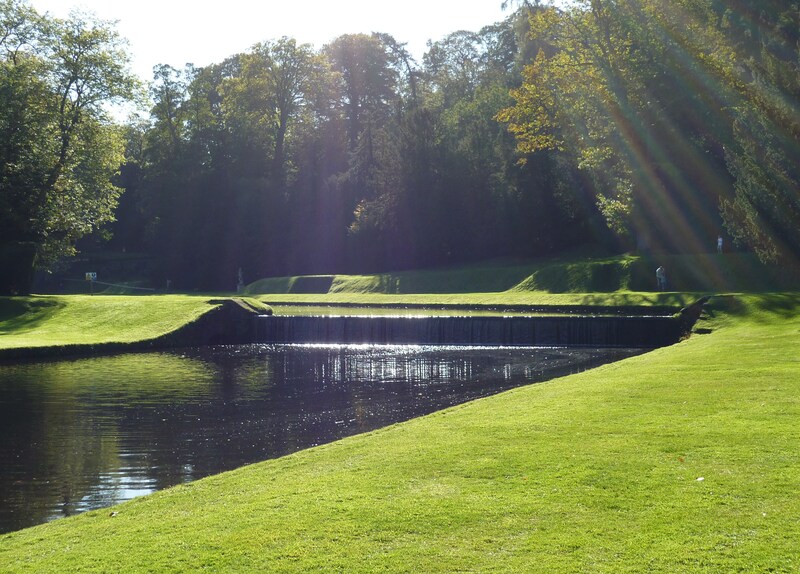 STEVE: (reconsidering his own suggestion, as he sees tourists walking around the ponds, on the area he imagines actors) Although actually, as soon as they start walking round this, I’m like, ‘Get off’. STEVE: No, no, no, get those people off! They’re spoiling it. DEE: No, you don’t like that? I think it’s remarkable. And the thing is, it does show up the grass as being not so green, doesn’t it? I think that stuff should cover the whole thing maybe! ALISON: But you mean – well there’s an interesting thought. If William [Aislabie] had AstroTurf to hand, would he have put down AstroTurf? Well, indeed he might. STEVE: AstroTurfing the whole place! DEE: Yeah. Or in the night, putting down AstroTurf and in the morning, do like a performance of lifting the AstroTurf. DEE: To prompt consciousness of management.